With the conclusion of his three-nation tour of China, Mongolia and South Korea last month, Prime Minister Narendra Modi capped a frenetic first year of diplomacy. It is becoming apparent that the emphasis on the Asian region will continue to be an imperative for the rest of his term. In this past year alone, the Indian Prime Minister has invested about twice as many days visiting the 'east' — Asia, the Indian Ocean Region and the Pacific — as against his 'westward' travels. Is this a reinvigoration of India's Look East policy? Does it mean relatively less importance to the West? And, what are the drivers of this policy? Barring the notable absence of West Asia from his travel schedule, it is clear that 'Engage Asia' has been the predominant mantra of Modi's early days in office. India’s defeat in the 1962 war against China continues to reverberate in the country—particularly for Hindu nationalists. A report in India’s Economic Times notes that the Hindu nationalist Rashtriya Swayamsevak Sangh (RSS) wants Indian schoolchildren to closely study and learn more about the 1962 war between India and China. India, led by Jawaharlal Nehru and the Indian National Congress at the time, lost the war. Even today, India’s defeat in 1962 continues to persist as a source of embarrassment, informing Indian strategic thinking toward China. The RSS is closely ideologically aligned with many members of India’s current ruling Bharatiya Janata Party (BJP) government—Prime Minister Narendra Modi launched his political career in part with a boon from his role as a pracharak (campaigner) for the RSS. Indian Prime Minister Narendra Modi is set to become the first prime minister of India to visit Israel. He will travel there later this year and will discuss strategic and economic cooperation with the Israeli leadership. The specific date of Modi’s visit remains uncertain, but, according to statements by India’s external affairs minister, Sushma Swaraj, the visit will come at some time after July, after preliminary high-level bilateral diplomatic talks with the Israeli government. Swaraj served as the head of the Indo-Israel Parliamentary Friendship Group from 2006 to 2009, and has long seen Israel as a “reliable partner” for India. Ahead of Modi’s visit, Swaraj will visit Israel, Jordan, and the Palestinian territories. While the Indian archives are still jealously kept by the Ministry of External Affairs (and other Indian ministries), the Chinese are slowly (and selectively) declassifying their archives. A cable from General Zhang Jingwu, ’On Issues of Relations between China and India in Tibet’ dating October 21, 1953, is one example. 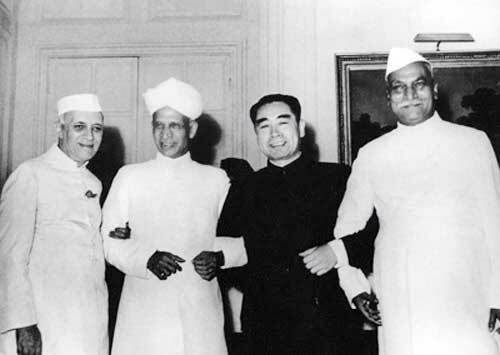 During the first months of 1953, Nehru may have felt that the situation was settling down in Tibet and slowly the Tibetans were accepting the invasion of their country by the Liberation Army as a fait accompli. A translation was recently released by Digital Archive of the Wilson Centre (International History Declassified). It belongs to the History and Public Policy Program Digital Archive, Ministry of Foreign Affairs of the People’s Republic of China. Zhang Jingwu was one of the signatories of the infamous Seventeen-Point Agreement between the People’s Republic of China and a Tibetan delegation (the so-called local government of Tibet). National Security: Do we need State Law or NCTC or Something else? PhD Scholar in Centre for European Studies, School of International Studies, JNU, and a Research Assistant at Foundation for National Security Research, New Delhi. The priority need to be addressed, but the means and end should have a clear seer of apparatus. Organised Crime and terrorism has a negative kinetic power in the South Asian region. 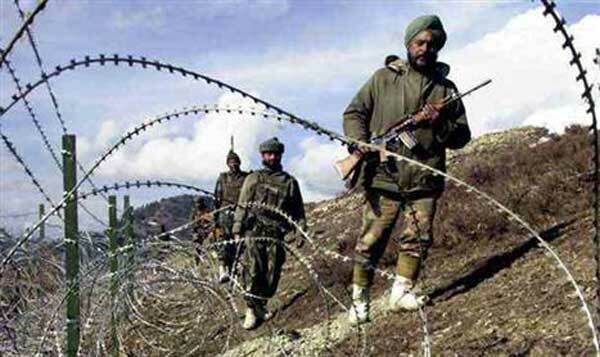 Porous border, stagnant cooperative security mechanisms has laid to the emergence of this complex cycle of threats. India is an enthusiastic super power in global level, it has to rethink its internal security architectures which is subsequently targeted by (un)conventional forces. "The State Department should designate Pakistan a 'country of particular concern' or its continued record of failure in protecting religious freedom." A court in Afghanistan recently sentenced eleven police officers to one-year jailterms for failing to stop a mob in March from lynching Farkhunda, a Kabul woman falsely accused of burning a Quran. Four men earlier had been convicted of and sentenced to death for her murder. If such justice is possible even in Afghanistan, hardly a bastion of protection for religious freedom and other human rights, why not in neighboring Pakistan? Why is there rarely any accountability in Pakistan for killing people accused of blasphemy? Why are law enforcement officials not held responsible for failing to apprehend the killers? And what, if anything, can the United States and the world community do about it? We all owe thanks to Sam Bateman for his excellent East Asia Forum article on June 1st in which he explains that the situation in the South China Sea around the Spratlys is not at all simple according to maritime law, that “innocent passage” is hedged with many conditions, and that freedom of navigation operations “are inherently dangerous”. He also points out that “other countries...have also undertaken extensive reclamation works on their occupied features, including building airstrips and adding military fortifications.” The Philippines, Vietnam, Taiwan and Malaysia have all built airstrips on their islands; the Philippines airstrip is over 1km long and can take C-130s. Of course, none of those countries is a rising power like China (though Vietnam is widely regarded as having defeated China in their 1979 war). However, China is other things as well. Most relevantly, it is a great trading nation, as no country is more aware than Australia. Most of the sea traffic in the South China Sea is headed to or from Chinese ports. Can America, Japan and Australia Combined Stop China in the South China Sea? The Asian security dialogue is about verbal jabs and thought balloons. And policy signaling and point scoring. And, ideally, some meeting of minds, reaching towards actual agreement. All gloves are off, as the United States, China and the rest of Asia stake their positions. As China emerges as the predominant indigenous power in Asia, it has become a pivotal force to a simultaneous process of integration and fragmentation in the region. On the economic front, China’s various initiatives, from the Asian Investment Infrastructure Bank (AIIB) to the "One Belt, One Road" new Silk Road megaproject, hold the promise of addressing growing infrastructure needs in Asia, further deepening existing trade and investment linkages in an increasingly prosperous region. Although, it must be said, China is most likely also driven by broader, long-term geopolitical motivations in pushing for these seemingly business-oriented ventures, especially since heavily investing in other countries’ infrastructure is also a bet on a lasting strategic partnership—if not a chokehold on their strategic sectors. Forming a “united front” shouldn’t mean eradicating China’s new media voices. President Xi Jinping recently gave a significant speech at the Central United Front Work Conference, in which he outlined the roles of non-Party intellectuals, overseas students, and representatives of the new media. These points, especially the last, have become hot topics on the internet. Happening Now: Ask Us Anything on Defense in the Asia-Pacific! Franz-Stefan Gady, Ankit Panda, Prashanth Parameswaran, and Van Jackson are authors for The Diplomat‘s Asia Defense blog. As most of you are aware, the blog focuses primarily on security, and defense issues in the Asia-Pacific region. What are the strengths and weaknesses of the People’s Liberation Army? Can the ambitious Indian submarine program succeed or is New Delhi still arming without aiming? Are Pakistan’s naval ambitions a pipe dream? Has the main battle tank become obsolete in Asian militaries? Will Japan step up its active defense posture in cyber space? Will the United States Navy continue to rule the Asian seas? And what about Russia’s re-emergence as an Asian naval power? China will host ASEAN defense ministers for the first time in Beijing later this year, a military official said at Asia’s premier security summit this weekend. According to Admiral Sun Jianguo in a speech to the Shangri-La Dialogue in Singapore, China will host the China-ASEAN Defense Ministers’ Special Meeting in October this year, reportedly on the sidelines of the 6th Xiangshan Forum in Beijing. The Forum, which was upgraded to an annual, track 1.5 event last year, is one of several ways that Beijing is trying to promote its new Asian security concept, which envisions an ‘Asia for Asians.’ Some have even seen the Xiangshan Forum as China’s answer to the Shangri-La Dialogue itself. “We are ready to discuss with other countries the way ahead for defense and security cooperation,” Sun said. State officials are quick to mention Russia’s economic troubles, ignore the EEU, and compliment China. Although his June 2 remarks at the Washington International Business Council focused primarily on India’s regional leadership, Principal Deputy Assistant Secretary of State for South and Central Asian Affairs Richard E. Hoagland had a number of things to say about Central Asia that are worth examining. While he certainly read from the Department of State’s standard book of lines in reference to the region, Hoagland notably omitted any reference to the Eurasian Economic Union, and had some kind works for China. There was considerable anticipation around the remarks of U.S. Defense Secretary Ashton Carter and Chinese Admiral Sun Jianguo, PLA Deputy Chief of General Staff, at the just concluded 14th annual Shangri La Dialogue. Secretary Carter's speech was widely praised for its balance, including by many Chinese present. Carter noted that America has been in the region for decades ensuring stability, and will continue to do so. China was portrayed as a bemusing troublemaker, throwing the stability of the region into question. There were some expectations that after last week's U.S. Navy's surveillance flight near Fiery Cross Reef with a CNN crew aboard, Carter would make a strong statement of what U.S. actions will come next. The mood in Washington is getting tougher on China, with calls to 'put skin in the game' and impose costs on China's behavior. Carter's speech did not give a clear indication of what future U.S. action might look like. He did make two concrete calls to South China Sea claimants: stop land reclamation, and don't undertake further militarization. Could the South China Sea Spark the Deadliest Conflict of Our Time? In his undergraduate years the U.S. Defense Secretary, Ashton Carter, did a double major in Medieval History and Physics. It was perfect preparation for Asia today—arcane and complex history speaking directly to modern mysteries. At the 14th Asia Security Summit in Singapore, the Shangri-La dialogue, Carter was two-thirds of the way through his text before he got to any substantive discussion of China or the South China Sea. It was like those medieval theological debates where the Devil was a major factor in discussion, even if it wasn’t named. 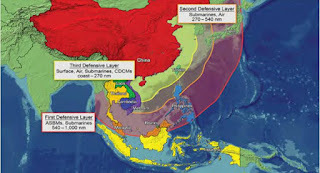 Chinese Active Defense Layers (Office of Naval Intelligence graphic). 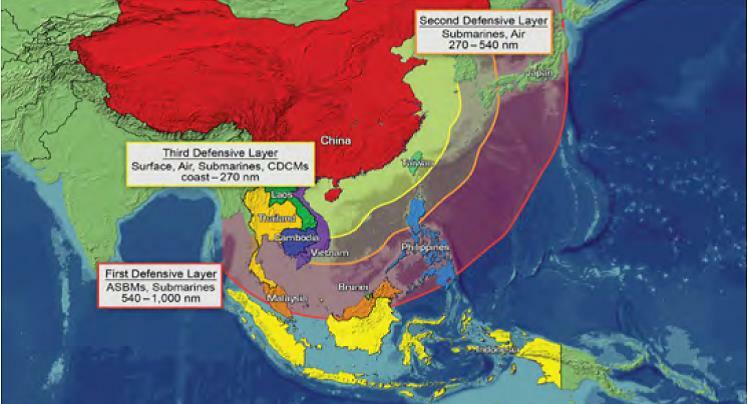 Note that the range lines reflect where PLA aircraft and submarines might be expected to operate in wartime based on evidence to date. While PLA aircraft would be unlikely to fly further east from the second layer's line if U.S. and allied air coverage from bases along the Second Island Chain was strong, the same might not be true for PLAN SSNs. Also note that the maritime approaches to Luzon and the northern/central Ryukyus fall within the PLA's middle layer, and Taiwan and the southern Ryukyus within the inner layer. In the case of India, there are no specific references in China’s white paper. However, there are several takeaways for India, says Srikanth Kondapalli. China released its 9th White Paper on defence issues recently. These have been issued in alternate years since 1998, although it had called the latest paper as the first such paper on ‘China’s military strategy’. Many of the paper’s positions are well known and sometimes have been repeated from the previous papers. However, one major direction of the paper signifies that China is contesting the United States global and regional dominance by openly advocating ‘protection of its interests abroad’ -- a phrase frequently seen in US documents. Firstly, as the major beneficiary of globalisation process by which today China had become the 2nd largest economy in the world and largest trading partner for 128 countries, it realises that it is invariably tied to the global economy. Yet, in the light of the United States’ global dominance, China’s challenge is to create a niche for itself, without at the same time becoming a target of the US bipolar ire that cost the Soviet Union dearly. The white paper made it clear on this issue thus: “International competition for the redistribution of power, rights and interests is tending to intensify”. The news comes as ISIS is marching on the suburbs of Aleppo, Syria's second-largest city. Rebels currently fighting the jihadists there told The Daily Beast that the U.S.-led coalition isn't even bothering to respond to their calls for airstrikes to stop the jihadist army. Iraq's army grows smaller by the day. Sectarian militants are picking up the slack. The lighting seizure of the Iraqi city of Ramadi by the Islamic State doesn’t just represent the loss of one of the last government-held population centers in Sunni Muslims areas of the country, but it laid bare the notion that Iraq’s government is capable of facing the existential threat posed by the Islamic State’s highly disciplined troops. Secretary of Defense Ash Carter infuriated his Iraqi allies last Sunday when he blamed the loss of Ramadi on the Iraqi Army’s unwillingness to fight, a bold and accurate statement by a U.S. official, perhaps the most candid and realistic I’ve heard from a U.S. official in the 12 years I’ve been covering Iraq. As harsh an assessment as that might have been, it still doesn’t come close to recognizing the myriad of problems that any coalition hoping to free much of Iraq and Syria—where the Islamic State now controls three provincial capitals spanning two countries—must address. On June 10, 2014, Mosul, which is Iraq's second-largest city, fell to ISIS as the Iraqi army fled. Today, Iraq's national military is in even worse shape, and may have as few as 5,000 "effective troops" under its command,according to Politico. GAZIANTEP, Turkey — Syrian rebels appealed for U.S. airstrikes to counter a new offensive by the Islamic State in the northern province of Aleppo that could reshape the battlefield in Syria. 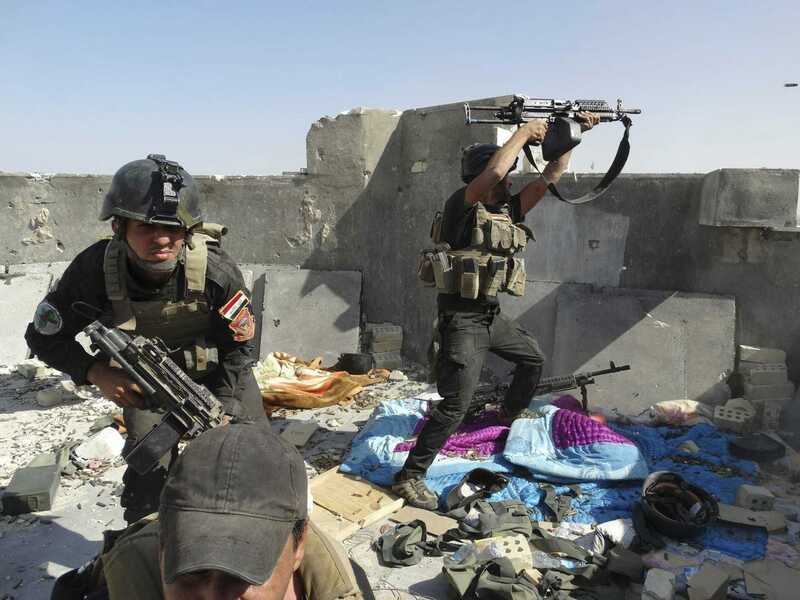 The surprise assault, launched over the weekend, opened a new front in the multi-pronged war being waged by the extremist group across Iraq and Syria, and it underscored the Islamic State’s capacity to catch its enemies off guard. Listen to any European or American leader talk about the transatlantic relationship these days and you will hear a handful of common refrains. Major policy addresses of this kind often start with the recognition that the world has changed. Europe and the United States face unprecedented challenges on the world stage, ranging from asymmetric warfare to non-state actors to the diffusion of technology to the return of great power politics. The speaker then reassures the audience by noting that, contrary to those arguing that the West is in decline, Europe and the United States come at these challenges from a position of strength. It has been the West, after all, that spent the last sixty years establishing the world order, and it is the West that has the ability to maintain and further develop the international order according to its common values. The United States is currently facing an alliance conundrum in the Middle East. As the Obama administration struggles to maintain positive ties with its Arab allies in the region, one country is securing large strategic gains: France, a NATO ally. This became more evident with the Saudi king’s cancelled participation in the Gulf Cooperation Council (GCC) meeting in Camp David last month, which took away some of the steam from the meeting, and intensified concerns about U.S. success in the Middle East. In recent months, however, France has grown surprisingly close to the GCC, and is currently an Arab favorite in the region. In the backdrop of this complex alliance quagmire, America is probably better off wooing back its traditional ally, Israel, despite recent sparring between the two over Iran’s nuclear program. The United States will help Vietnam bolster its maritime security by providing $18 million to Hanoi for the acquisition of coast guard patrol vessels. The initiative marks the first major development on defense cooperation between the two erstwhile enemies since the partial lifting of the decades-old U.S. arms embargo against Vietnam late last year (the embargo still excludes lethal arms). Carter’s visit comes just weeks after the 40th anniversary of the fall of Saigon, the event that marked the end of the Vietnam War. U.S. Defense Secretary Ashton Carter remarked that he hoped the U.S. financing offer would lead to a growing security partnership between the two countries: “After 20 years there is more we can do… [to] enhance our capabilities and the capabilities of Vietnam,” he noted. Russia emphasized that it retains the right to deploy nuclear weapons anywhere on its territory, including Crimea. In an interview with Russian news media, Mikhail Ulyanov, the Director of the Department for Non-Proliferation and Arms control at the Russian Foreign Ministry, said that Russia could deploy nuclear weapons to Crimea. “Russia obviously retains the right if needed to deploy its nuclear weapons anywhere on its national territory, including on the Crimean Peninsula,” Ulyanov said. A real ‘revolution’ in history of warfare was ushered in 1945 when the human beings tapped the forces of nature trapped in tiny atom, a force of vast proportion that has the capability of destroying the entire planet earth. This led to a turnaround in the relationship between politics and warfare. Nuclear war/weapons were no longer a ‘means to achieve political ends’ but instead the principal aims of politics today is to avoid nuclear war. In the pre-thermonuclear age security strategies had two basic dimensions – defensive and offensive. The UAV prototype is a high-altitude, long-endurance (HALE) multi-mission platform with both long-range surveillance as well as strike capabilities and “has been the subject of speculative conceptual drawings since 2012,” according to IHS Jane’s Defence Weekly. It boasts anti-stealth capabilities, a special purpose radar andreportedly first flew in February 2015.
Who Represents Labor Market Outsiders in South Korea? If South Korea’s left won’t represent the poor, who will? Political scientist Joseph Wong recently tweeted, “Who does the Left represent today? Unions or the very poor? Labor market insiders or outsiders?” It is a pertinent question for most, if not all, democratic countries. Given the setbacks for leftist and liberal politics, the questions seem particularly appropriate in South Korea. The United Progressive Party (UPP), which claimed to represent labor, was recently disbanded by court order after a band of politicians with questionable motives pushed the party hard left. The mainstream New Politics Alliance for Democracy (NPAD) is better off, but only marginally so. It is racked by intraparty strife and an inability to nail down anything resembling a programmatic party platform — a set of consistent and predictable policy positions with a clear ideological foundation. The South Korean left is, like the left elsewhere, reeling from an identity crisis. What is to be done? Let’s get this straight. Republican senators are outraged by government overreach, which is why they are manning the barracks against theEnvironmental Protection Agency’s (EPA) water rule. They are also outraged by Rand Paul, who has forced warrantless bulk telephone metadata collection ensnaring millions of ordinary Americans to lapse. The EPA is indeed out of control. There is also a legitimate debate to be had over how to balance liberty and security, both goods the federal government is tasked with preserving. But there is a bit of cognitive dissonance here. Maybe there’s a compelling case for the expired provisions of the Patriot Act, but relatively few of Paul’s GOP detractors have deigned to make it. For the most part, they have operated with a strong presumption in favor of government power that they would otherwise reject if it was a domestic program. Long a staple of science fiction, laser weapons are edging closer to the battlefield — thanks to optical fibres. Silently, the drone aircraft glides above the arid terrain of New Mexico — until it suddenly pivots out of control and plummets to the ground. Then a mortar round rises from its launcher, arcs high and begins to descend towards its target — only to flare and explode in mid-flight. On the desert floor, on top of a big, sand-coloured truck, a cubic mechanism pivots and fires an invisible infrared beam to zap one target after another. This High Energy Laser Mobile Demonstrator (HEL MD) is a prototype laser weapon developed for the US Army by aerospace giant Boeing of Chicago, Illinois. Inside the truck, Boeing electrophysics engineer Stephanie Blount stares at the targets on her laptop's screen and directs the laser using a handheld game controller. “It has a very game-like feel,” she says. Although wars between even small nations are tragic for the populations involved and can cause wider problems in the international system, the prospect of armed conflict between major powers is the true nightmare scenario—especially in an era of nuclear weapons. The two world wars that so horribly scarred the twentieth century provide important reminders of the dire consequences of great-power conflicts. It follows that all responsible major countries should avoid actions that increase the risk of needless confrontations. Unfortunately, the level of danger from such conduct appears to be rising rather than declining.